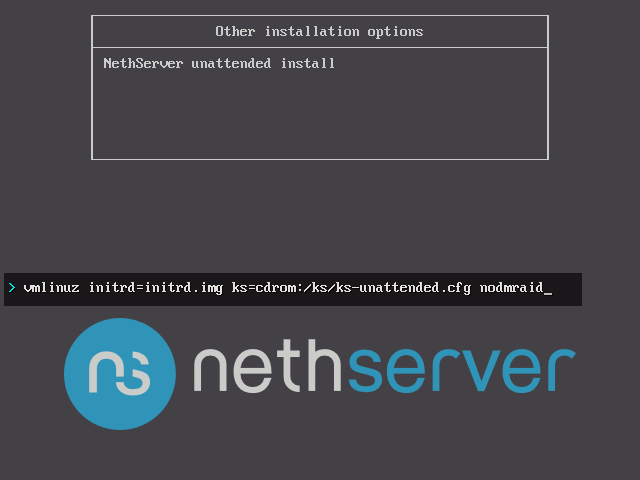 NethServer Unattended Install does not require any kind of human intervention: a set of default parameters will be applied to the system. Optionally, advanced settings can be specified by editing the boot options. The advanced boot options allow you to set additional parameters in order to customize the installation. To specify additional parameters, highlight the desired menu entry then press the [↹ Tab] key to reveal its boot options. Towards the bottom of the screen, you should see the boot loader command line where extra parameters can be set. To set multiple parameters separate them with a space. where sdx and sdy represent the hard drives you want to use. Replace these values according to your system (i.e. sda,sdb ). replacing en_US with the ISO language code of your desired language. Refer to the Language codes table. replacing us with the appropriate keyboard code. Refer to the Keyboard codes table. replacing Greenwich with the desired timezone, which may be any of the timezones listed in the /usr/share/zoneinfo directory. Refer to the Timezones list. The timezone can also be set later from the server-manager. replacing secretpassword with the desired password. When enabling this option, all data written to the disk will be encrypted using symmetric encryption. In case of theft, an attacker will not be able to read the data without the encryption key. You will need to enter the password at every system boot. Once the desired parameters have been set, hit the [↵ Enter] key to confirm the boot options and start the unattended installation. Otherwise, press the [Esc] key to cancel the edition. The installation will erase all existing data on hard drives! Once at NethServer installation's boot menu, use the [↑ Up] and [↓ Down] arrow keys to select the Other installation options > menu entry, then press the [↵ Enter] key to access its sub-menu. At the sub-menu select NethServer unattended install. Optional: If you want to specify advanced boot options this is the right moment to do so. Hit the [↵ Enter] key to start the installation: wait until the process finishes. At the end, the system will reboot and you can remove the installation media. Finally, you will be presented with the login prompt (where, upon login, you will be able to do advanced administration tasks). the show option can be replaced by list, or it can be omitted. Once you know the IP address, you can logout by hitting [Ctrl]+[D] keys, or by pressing the [↵ Enter] key after issuing the exit command. At the end of the installation procedure use NethServer's IP address to access the server-manager, where you can personalize the configuration and install additional software.